Have your heart set on a 2018 Mazda3? Don't buy, lease or purchase one until you read this! 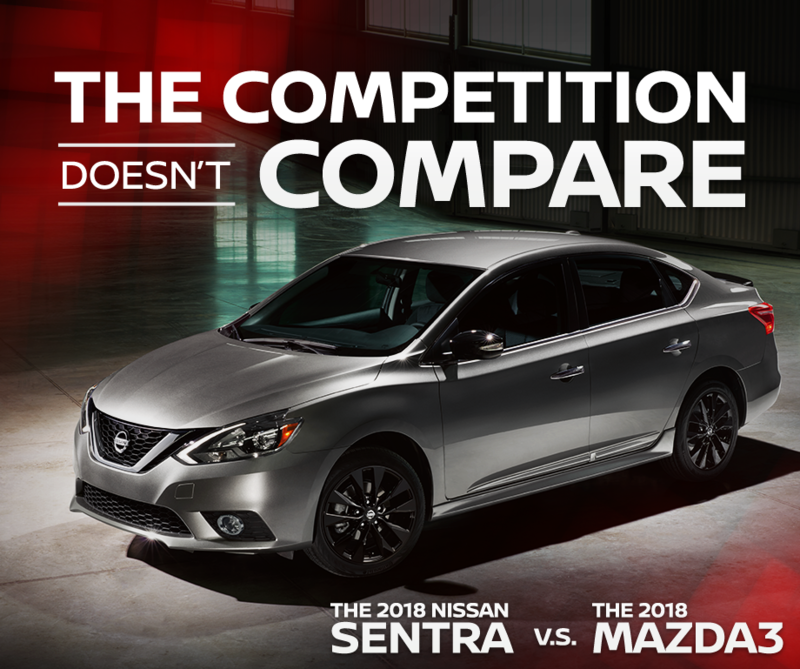 Flagstaff Nissan has gathered all the facts on why the 2018 Nissan Sentra is an overall better drive than the 2018 Mazda3. But you don't have to take our word for it! Test-drive the 2018 Nissan Sentra today at Flagstaff Nissan. Get More For Less, $1,105 Less! Even at the lowest trim level, the 2018 Mazda3 is at least $1,105 more than the 2018 Nissan Sentra. But that doesn't mean you won't get award-winning features and you've come to expect from Nissan! With more available trims, the Sentra gives you the power to choose your performance and fuel efficiency levels. The 2018 Nissan Sentra boasts 8 different trims with different comfort, interior and exterior features; and power - while the Mazda3 only gives you 3 to choose from. The Sentra's newest version of its Xtronic CVT® transmission offers a traditional transmission feel that's fun to drive with up to 188 hp, while the Mazda3's top trim only reaches 184hp. Plus, the Sentra's SR and SL trims, deliver up to 29 miles per gallon throughout the city streets of Flagstaff, and up to 37 MPG on the highways of Arizona - Mazda's top trim only goes up to 36 MPG HWY. Drive with added peace of mind knowing that the 2018 Nissan Sentra was designed with your safety in mind. With available features like Forward Emergency Breaking, Blind Spot Warning, and Rear Cross Traffic Alert, driving is smarter, easier and safer than ever. Plus, the 2018 Sentra offers Advanced Drive-Assist® Display, Vehicle Dynamic Control with Traction Control, 6 standard air bags, blind spot monitoring, a tire pressure monitoring system and more! Still thinking of driving a 2018 Mazda3? We didn't think so. Get behind the wheel of the sedan that delivers more for less today at Flagstaff Nissan! With more features, more power, and better fuel-economy, the 2018 Nissan Sentra is the right choice at the right price. Explore our available inventory online now, or fill out the form to schedule your test drive today!